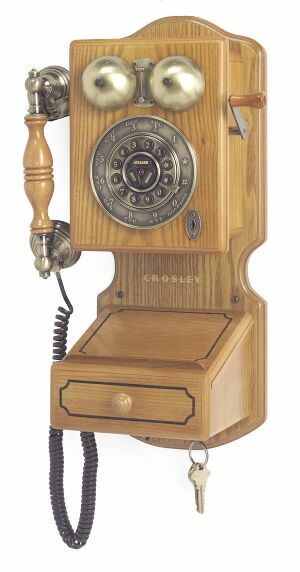 Old Fashioned Phones / Telephones in Antique style & Vintage style Crosley CR Replica / Reproduction Telephones. 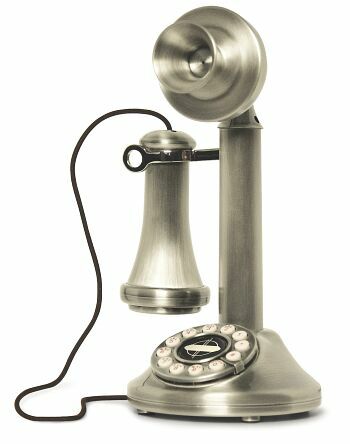 Deco / Retro candle stick candlestick telephones, 1950's public payphones pay-phones by Crosley CR56 CR91 CR92 CR93 CR64. Also novelty telephones for sale by Crosley. and will work with your home phone system. ORDER NEW CROSLEY PHONES SECURELY ONLINE VIA CREDIT CARD OR PAYPAL FOR DOMESTIC GROUND SHIPPING TO LOWER 48 STATES. YOU MAY PLACE YOUR ORDER BY PHONE WITH AN ADDITIONAL OPTION OF REQUESTING EXPEDITED / INTERNATIONAL SHIPPING. Click on GROUND SHIPPING to estimate the delivery time to your location in the US, lower 48 states. 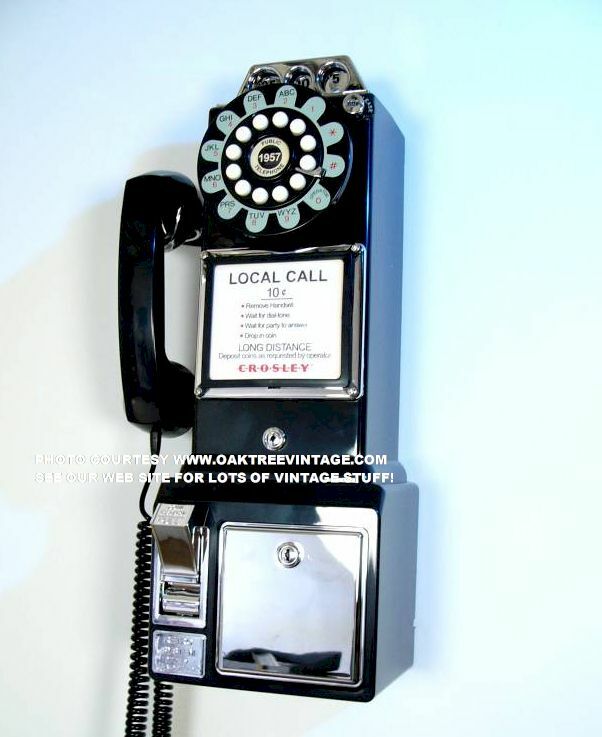 Authentic looking 1950's style payphone by Crosley! 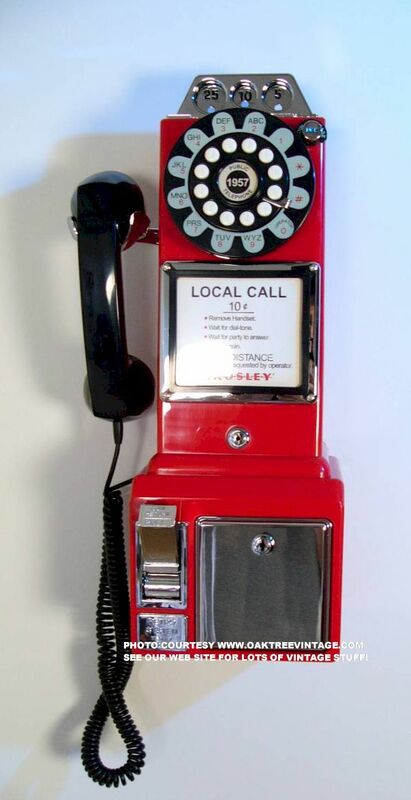 This classic model will take you back to the days of old fashioned phone booths and five-cent calls. Drop in a coin and you'll hear the original brass jingle. The push buttons even have an authentic rotary look. Wall or desk mountable with heavy-duty ABS plastic cabinet, chrome accents, full featured coin bank with lock and key (coins not necessary to make a call), modern US phone jack hook-up and tone or pulse line selectable. Other features include a receiver volume control, ringer volume control, pulse / tone system selector and the "Coin-Return" button is the "Last Number Redial"! This is our favorite phone! Lots of fun to use. Will look great in office, game room, cafe, bar, business, den, living room or any place the "Fab" look is desired. Measures 18.25" tall x 9" wide x 6.5" deep. 90 Day limited warranty. 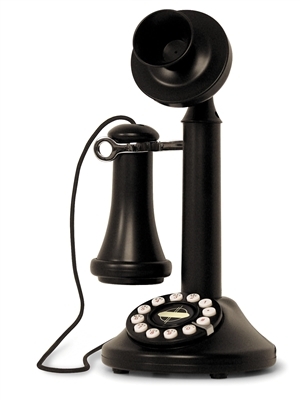 The Classic "Candlestick" telephone, also known as the �Upright� initially became popular during the early 1900s before the introduction of the one-piece handset. 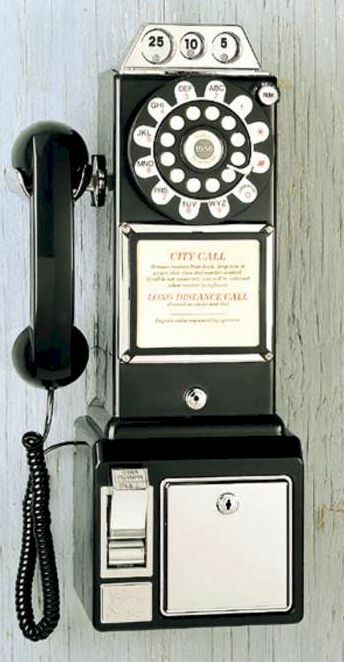 The first Candlestick phones were introduced when the magneto system was in use, which meant that the phone was connected to a large wooden box called a "subset" containing a battery, bell, and crank, but oh have we come a long way. From its bell-shaped mouthpiece to its cloth covered receiver cord, this telephone replica recalls a vintage instrument from the 1900's. But a closer look reveals some modern technology including a decorative dial that functions as a push button for tone/pulse operation as well as a center medallion that serves as a redial button. This modern day version of the Candlestick Phone would have surely made Alexander Graham Bell proud. Ringer Volume / On /Off switch. Earpiece Volume Control. Tone / Pulse Switch. Made of hi-impact ABS plastic. Dimensions 6.5" w x 11.75"h x 5.5"d. Shipping weight 6 pounds. 90 Day limited warranty. This colonial style country kitchen phone is an authentic reproduction of early American heritage. While this beautiful recreation is designed to provide extremely high quality communications, it has all the charm of the faithful original. Originally introduced in the early 1920's, this classic features a crank handle that actually turns. The Crosley Country Kitchen Phone II features touch-tone buttons with a rotary look, complete with speaker and hold/mute functions. The handcrafted wood and veneer cabinet is enhanced with striking brushed bronze-plated hardware. This beauty is as functional as it is fabulous as it includes a pull out storage compartment, volume controls for ringer and receiver and the option to change between tone/pulse. Dimensions approx. 9"w x 17 1/2"h x 7"d 6 lbs. * Stock levels and 'Due Dates' for restocking are ESTIMATES only. Subject to change sometimes with-in minutes. 30% restock fee / service charge applies to all returns for refund on Crosley Products.